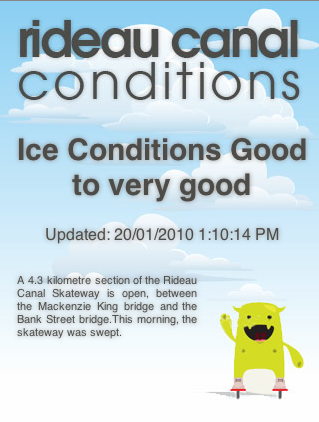 For those of you who live, frequent, or visit Ottawa during the winter, well you know that they freeze the canal and everyone goes skating...kind of. Well some people do. (They sell beaver tails and hot drinks on it too.. its pretty cool). Anyway, one of the guys I work with made a little mobile friendly page that pulls information from the NCC website (which isnt very pretty, or east to use). Just to put everything into context... everyone in my office uses an iphone so his comment of course is referring to one.